Further tales of android depression. At Anime Expo 2018, publisher Viz Media had some good news for fans of crying about sad androids. Nier: Automata. Short Story Long is a collection of short stories fleshing out the world of Automata, authored by the series' two lead writers; Yoko Taro and Jun Eishima. While some of the tales are Yoko Taro's older works, several are promised to be all new adventures specifically written for the book, which should be out in English in 2019. While I would never ask for a direct sequel to Automata (those characters have suffered more than enough and deserve some time off), I'd love to hear more stories set in its strange and fractured post-apocalyptic world, which is just what this book is offering. Among the stories collected in Short Story Long is a novella that I'm already quite familiar with. The Flame of Prometheus is set during the many thousands of years between the original Nier and Automata, and tells the tale of an abandoned, shattered and buried robot piecing itself back together before embarking on a quest to return to the surface world. Don't worry about spoilers, either. 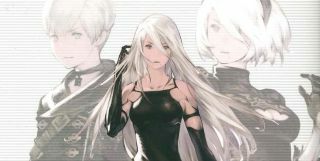 Fans of the original Nier will find some extra details to appreciate here, but it's otherwise an entirely standalone story within the broader setting. This particular story is specifically familiar to me as it was unofficially translated some time ago by fans. You can read it here, semi-illustrated, as part of The Dark Id's excellent Let's Play for Nier: Automata. Consider it a demo of the book to come, and the reason I'll be buying a copy for myself the moment it's available.